The wide-spread coccolithophore Emiliania huxleyi (Prymnesiophyceae, Haptophyta) is a unicellular eukaryotic alga, responsible for the largest oceanic algal blooms covering thousands of square kilometers. Its intricate calcite exoskeleton accounts for ~1/3 of the total marine CaCO3 production. E. huxleyi is also a key producer of dimethyl sulfide (DMS), a bioactive gas with a significant infochemical role in mediating microbial interactions, as well as climate role in feedback to the atmosphere and regulation of cloud formation. Therefore, biotic interactions that regulate the fate of these blooms play a profound role in determining carbon and sulphur flow in the ocean. Annual E. huxleyi spring blooms are frequently terminated by infection of a specific large dsDNA virus (E. huxleyi virus, EhV). EhV belongs to the Coccolithoviruses which is a group within the monophyletic Phycodnaviridae, a family of nucleocytoplasmic large DNA viruses (NCLDV). Studying the replication strategies employed by giant viruses that infect algal cells. Understanding host-virus arms race on the single cell resolution. Revealing the novel role of cellular mechanisms (e.g. programmed cell death, autophagy, life cycle) in controlling host susceptibility to viral infection. 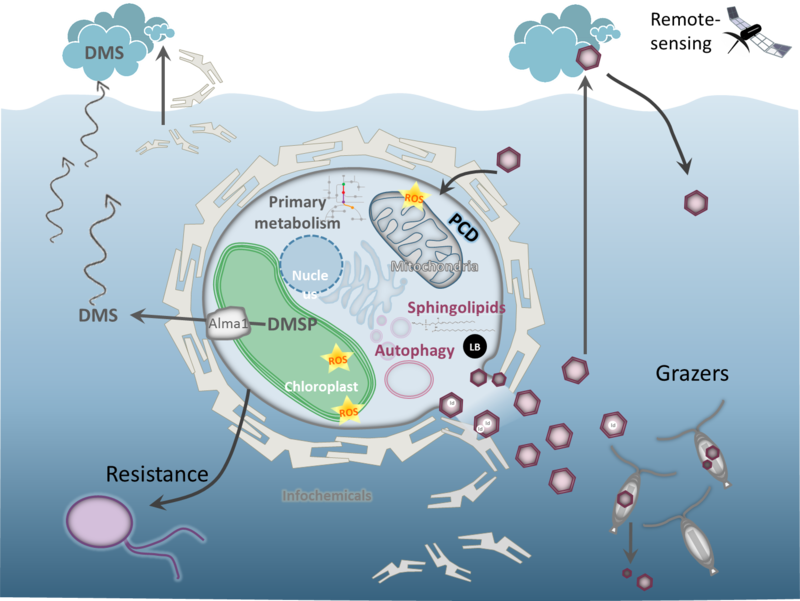 Elucidating the metabolic basis (primary and secondary metabolism, sphingolipids) for host-virus interactions in the marine environment. Elucidating the functional role of extracellular vesicles in mediating host-virus interactions. Development of novel cellular markers for detection of host-virus interactions in the natural environment. Elucidating large scale mechanisms of viral dissemination. Developing quantitative tools to track large scale impact of viral-induced bloom demise. A model describing recent projects in the lab focused on understand E. huxleyi-EhV interactions from the molecular scale to global impact. Projects include understanding the metabolic basis for infection and resistance, cellular mechanisms (autophagy, PCD, meiosis) and viral replication strategies that facilitate infection. In addition, we investigate ecological processes such as viral dissemination and the impact of viral infection on the marine food web and ocean-atmosphere feedback.